Would you do as a robot commands? Robots are beginning to play a larger role in society, finding their way into hospitals, the military, and our daily lives; it's not too far off to think that they may one day be put in positions of authority over people. We know all to well the dark side of authority from classical psychology experiments such as the Milgram and Stanford Prison Experiments, but one question remains: can the authority figure effect apply to robots as well as people? As a preliminary study we decided to test this theory out; we had our robot pressure participants to continue a highly tedious (and unpleasant) task, and compared the results to having a human experimenter. Did they obey the robot? Check out the paper and project video to find out! Derek Cormier, Gem Newman, Masayuki Nakane, James E. Young, Stephane Durocher. Would You Do as a Robot Commands? 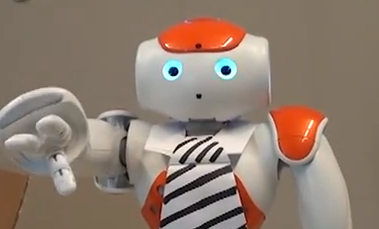 An Obedience Study for Human-Robot Interaction. In Proceedings of the First International Conference on Human-Agent Interaction, iHAI'13.